Splitrock's Maybe I'm Amazed "Maze"
We are proud to add Splitrock's Maybe I'm Amazed (Maze) to our breeding program. 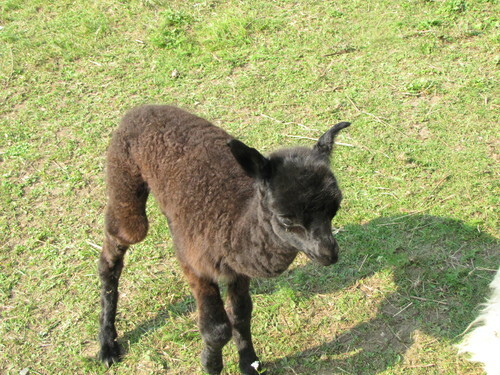 He is a goegeous black colour and has super fine fleece. His second fleece was only 20.7 microns! That is excellent for a black. 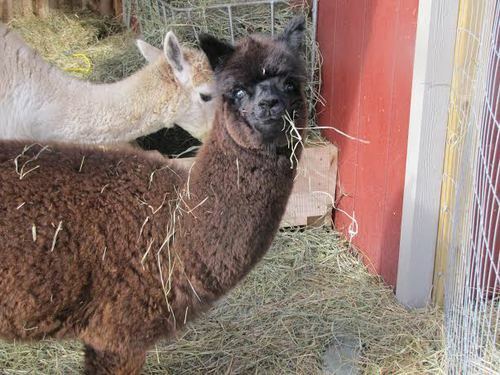 Maze comes from a line of truly fine alpacas: his sire, Hawkeye's Raven Child still had a micron count of only 23.1 at 7 yrs old; his dam had a micron of 21.6 at 6 yrs and his grand dam had a micron of 21.5 at 6yrs! Rachelle has a nice fleece - very light fawn in colour, fine and dense with a moderate amount of crimp, and a wonderful handle. She is very friendly with people and playful by nature perhaps due to the fact that she was close to humans a lot due to her being born about 3 weeks prematurely. 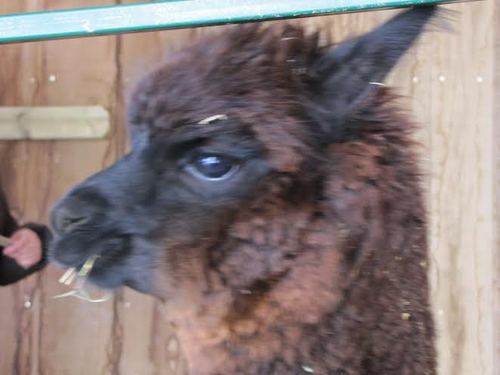 However she recovered well and has grown into a full sized normal alpaca meeting all breed standards. Tiberius has an award winning father and a fantastic mother. 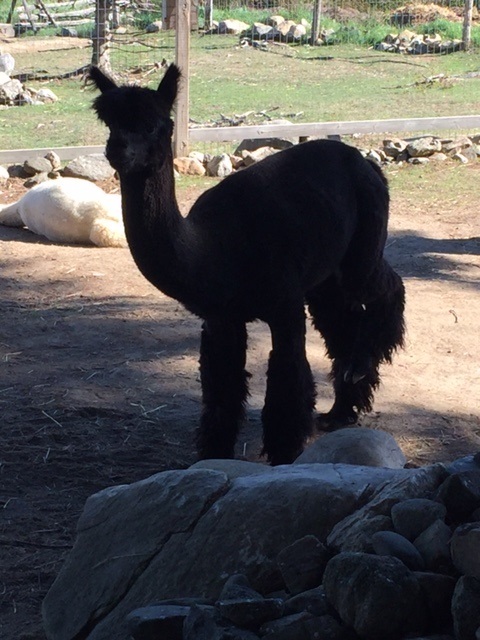 He was anxious to join our herd in 2013 and he arrived on day 335 of Rachelle's pregnancy. He was standing within 20 minutes and is getting bigger and stronger every day. 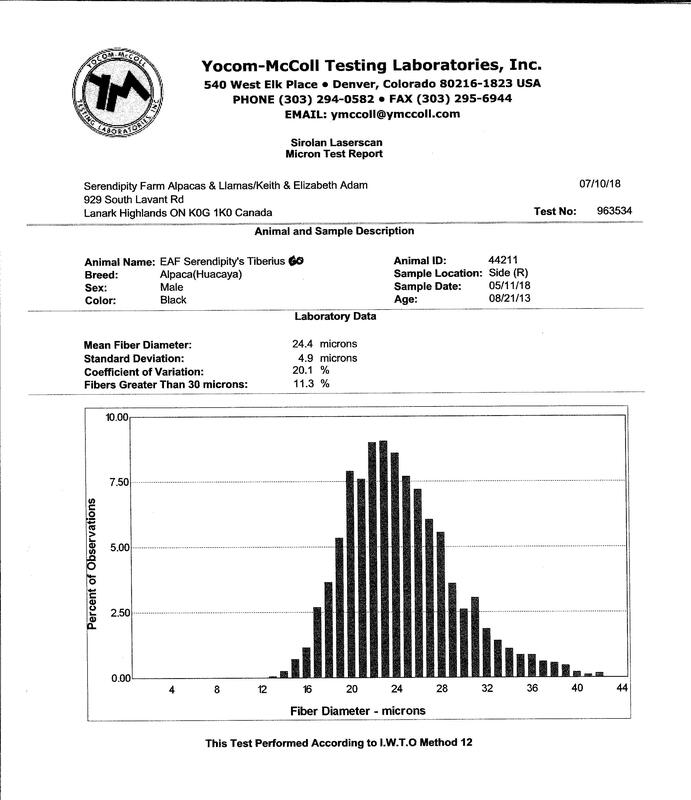 He has excellent fine, curly black fibre with a 21.2 micron count measure. His parentage has helped him develop into a confident "alpha male" at an early age - he is big, strong, confident and a proven great stud! He was used as stud in 2017 with KA Pistol Annie and produced a stunning Black female in 2018!